Knitting and reading on this beautiful, cold, rainy fall day, so I thought I'd join with Ginny on her Wed. yarn along to share what I've (we've) been reading and knitting. 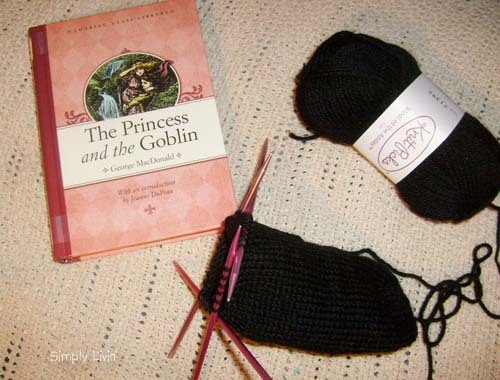 Annie has been reading aloud to us, the Princess and the Goblin and I've been knitting a black pony for the toy barn as I listen in. We just finished it in fact, and are on to the sequel. 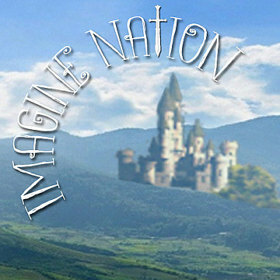 It's a very sweet and classy fairy tale story, having been written back in 1872 by George McDonald, who's writings inspired others such as C.S. Lewis, J.R.R. Tolken and Luis Carroll. In fact, as Annie was reading, she paused to say, "his writing style reminds me a lot of C.S. Lewis' Narnia, I'll bet he borrowed some inspiration from him." I disagreed, but looked it up anyway, surprised to find her very much correct in her assumption! Anyhow, it's a sweet read aloud book that I would recommend for those who enjoy Mr. Lewis' writing style. Wow, read that book over fifty years ago. Glad to see that it is still being read!